Hop to the Top is one of Fronk's microgames in WarioWare: Twisted! The game's purpose is to make Fronk reach the top of the building. 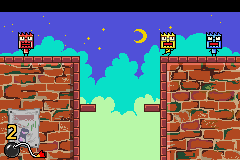 To do so, the player has to make him do a Wall Jump until the top is reached. This page was last edited on October 29, 2018, at 21:31.